Pekka prepares himself for the game against the Florida Panthers. The Predators didn’t fair too well in Raleigh, North Carolina against the Hurricanes on Tuesday night, prompting the team to take their next game a wee bit more seriously. Although another Eastern Conference team, the Florida Panthers are currently 1st in the Southeast Division, meaning the Predators would need to be a little more focused and much more ready to hit the ice (the Hurricanes are 5th in the Southeast). Brian McGrattan is still sitting pretty on the IR, but was overheard as saying he should be back possibly by Tuesday’s game against the Kings (We’ll hope for that one). Kevin Klein is also feeling the pain from a recent injury, taking a night off to rest. Rookie Ryan Ellis is still fighting off a cold of some sort, and Brandon Yip and Matt Halischuk were the healthy scratches. The Predators got the ball rolling at 11:35 of the 1st with a snap shot from newcomer, Andrei Kostitsyn, his 13th goal of the season and his 100th overall. With this just being his second game in a Predators sweater, AK46 is making a good name for himself with the team and the fans; looks like Sergei might have some competition as favorite brother. Paul Gaustad and Hal Gill picked up the assists on AK46’s goal, making for a “Trade Pick” goal. Mike Fisher wasted no time in the 2nd period, scoring his 19th goal in just 28 seconds with a snap shot past Scott Clemmensen. Martin Erat picked up his 33rd assist on Fisher’s goal. Florida would outplay the Predators for their first and only goal of the night, clearing the ice and giving Wojtek Wolski what was basically an empty-netter (sorry Peks) at 7:49. The 2nd period would end with the Predators still on top 2-1. David Legwand would seal his 15th goal of the season at 7:02 in the third with a backhander past Clemmensen. Andrei Kostitsyn and Ryan Suter picked up the assists on Leggy’s goal. Similar to Nashville’s catfish, the Florida Panther fans throw their own animal of choice. 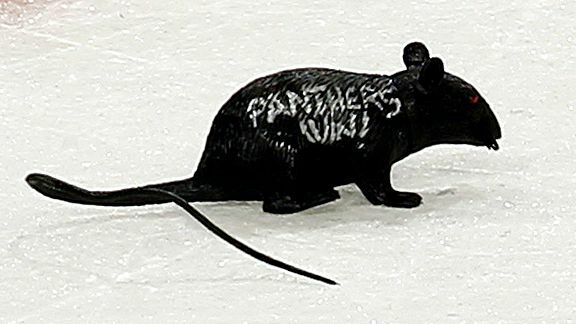 This is just a generic photo we found on Google, so we’re almost positive the rat did not say “Panthers Win!” on it, but just in case you missed Hillen being smacked with it. As Nashville goes, the Predators won and still were out-shot 40 to 23 overall, with Pekka blocking 39 of those on goal (isn’t he a Finnish dream boat?). It’s pretty clear as to why Pekka Rinne was the First Star of the Game tonight. The Predators are lucky Pekka is as good as he is, due to the fact they took some unnecessary penalties tonight, three compared to Florida’s one. Luckily, the Panthers were unable to capitalize on any of the chances handed to them. The Predators redeem themselves after the loss on Tuesday against the Hurricanes, showing no mercy to former Preds Jerred Smithson and Marcel Goc. The Predators are finished with the Eastern Conference for a while, coming home to take on the L.A. Kings on Tuesday and then welcoming back Shane O’Brien and the Avalanche on Thursday night. Andrei Kostitsyn celebrates his 100th career goal.